I’ve been happily using a RigBlaster NoMic and a PK-88 for data modes for the past decade. However, a recent interest in 9600 baud packet meant neither of these devices were suitable. The PK-88 is a fixed 1200 baud hardware TNC and the RigBlaster NoMic has an inadequate frequency response due to the isolation transformers. Correction: The PC Out schematic has an error – the resistor to ground should be 100 ohm, not 10K. I decided to use a small relay for the PTT although an opto-isolator would have been an alternative solution (but the click is a nice audible confirmation of TX). Here the resistors divide the voltage from the RTS pin to a more suitable level for the transistor (I think I used a 2N2222) and the first diode scrubs off any negative voltage. Real RS232 ports swing +/-, forgetting this, I omitted this diode at first then wondered why two transistors quickly failed. Connecting to a scope quickly reminded me of my error! The final diode should probably be directly across the relay contacts – if building this, I’d suggest you move it. 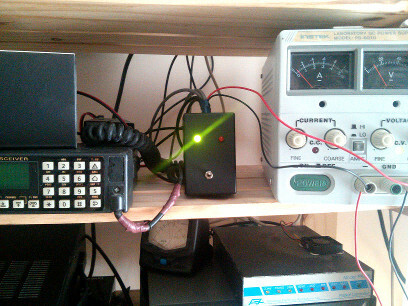 The Radio (data out) ports are switched then DC blocked via a small capacitor to remove any DC bias. I’m hoping the small capacitor won’t effect frequency response too dramatically. The PC (soundcard out) is a basic voltage divider with again a small capacitor to scrub off any DC bias. The adjacent photo shows the assembled device (click to zoom). I added a power LED plus a TX LED connected to the secondary relay contacts. It seems to work well. Update: Attenuation needed to be removed for 9600 baud. This doesn’t appear to effect 1200 baud (alsamixer provides enough control over audio levels). This entry was posted in Uncategorized and tagged 9600, interface, packet, soundcard. Bookmark the permalink. – The value of C in the Rx wire?. Is it needed if I’ll be only using the cable for 9600 bauds operation? – I am planing to use this interface for downling (RX) and a TNC for uplink (Tx), as the transceiver I am using has two data ports each one for each band (Sub or Main) the interface is going to be plugged in the Sub data port and the TNC in the Main data port, do I need the PTT and Tx wires in the interface?, or as long as I will have them on the TNC I don’t need to build them for the interface and only be worried about to build the Rx wire of it? When running at 9600 baud the levels are very important. For this reason, depending on your equipment you *may* need to omit the attenuator on RX. The very simplest solution would be to simply connect the 9600 audio out of the radio directly to your PC soundcard input. I’d personally isolate the RX using a small DC blocking capacitor (a small value ceramic capacitor), then, if the levels are too high, add an attenuator. If using a TNC for TX the PTT circuit is not needed. However, if you have a 9600 baud TNC I’d personally use it for both TX and RX. Decoding 9600 baud via soundcard can be tricky whereas your hardware TNC should ‘just work’. 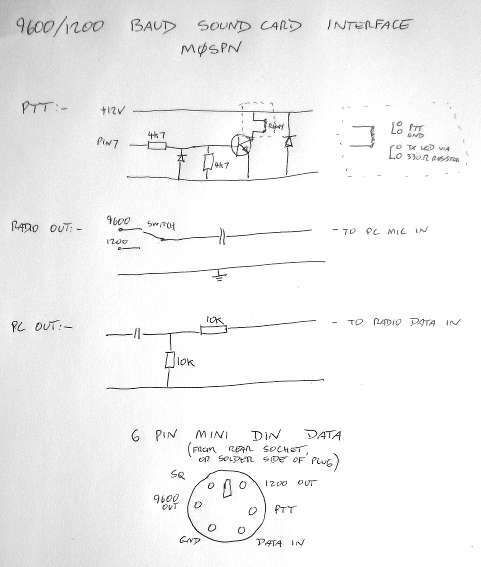 a) I had this homemade interface connected to the data socket Sub and the Line In, and another commercial interface (with isolation transformers) consisting of the PTT and TX attached to the Data Socket Main and a USB and the Line Out )I am not using a TNC yet). With this configuration the PTT stops working, and if I remove the homemade interface and connect the RX cable of the commercial interface (so now the commercial interface does all: PTT, TX and RX) then the PTT works. b) Other problem is that with the homemade interface even with a huge value of threshold in the radio(when I am using the commercial interface with a huge value of threshold the radio eliminates all the noise) there is a lot of sound receiving by the Line In when there is no signal receiving (Like a lot of noise), which has no sense since the radio eliminates it. I was wondering if you could help me understand the cause of these problems, maybe it is because I didn’t add the capacitor?. Any help would be very appreciated. Thanks in advance. The 9600 data out is straight from the discriminator, before any EQ or processing (ie squelch) is applied. Typically, with sound card modes this isn’t an issue as the decoder can discriminate between data and white noise. Also, if you have strange behaviour keying the PTT, check the orientation of the transistor you used. If you do use a 2n2222 keep in mind the pinout is the reverse of a typical NPN transistor (I think collector and emitter are swapped? ).